A short deck hold'em battle of the Bens: Breaking down a big fold by Yu in a hand versus Lamb. 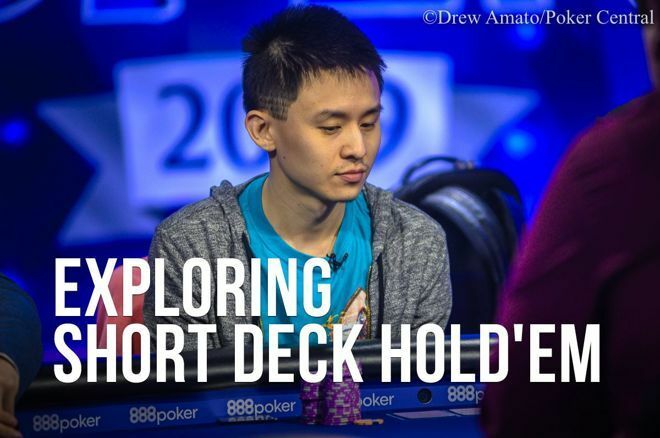 Exploring Short Deck Hold'em: Ben Yu finds a big (correct) river fold in a hand against Ben Lamb. With short deck being such a young game, the meta is still developing in its early stages, providing the opportunity for astute students of the game to get a grasp on the concepts behind it and get ahead of their peers. Jason Somerville has posited that pot-limit Omaha players have been able to latch onto short deck concepts well because the game plays similarly to PLO in a lot of ways. Mixed-game players in general are used to figuring out things a little more quickly and on the fly, rather than diving deep into specific situations as no-limit players often must. That means a guy like Ben Yu — whose mixed-game mastery has enabled him to accrue over $6 million in cashes, three bracelets in three different games, and numerous other high finishes in various non-hold'em formats — makes a natural fit for short deck. It was no real surprise, then, that despite Yu having no previous short deck cashes, to see him make an appearance at the final table of the 2019 U.S. Poker Open $10,000 Short Deck event. There Yu tangled in a big pot with high-stakes PLO reg Ben Lamb. At the time, five players remained in the event, with the two Bens on the shortest stacks — just over 40 antes at 25,000 for Yu and right at 50 for Lamb. Big stack David Peters opened things with a call under the gun holding . After one fold, Yu came along with and Lamb checked his option holding . The flop came and Peters checked. Yu bet 100,000 and Lamb raised to 260,000. After Peters folded Yu just called, and the turn brought the . Both players checked and the completed the board. Yu checked again, and Lamb shoved all in. After using a couple of time extensions, Yu mucked his hand and gave up the pot. Here we start with yet another limped pot, which should come as no surprise. This time, the flop seems to indicate a nothing hand, one that will be over soon. After all, nobody has any real equity besides Yu with his trip nines. However, things get interesting. Yu makes the reasonable decision to bet here and faces a raise from Lamb, who could obviously have any two cards on the button. Lamb's decision to bluff is interesting because I would expect bluffs in this spot to be gutshots — i.e., Q-J, Q-T, and J-T. The fact that Lamb chose indicates he may be choosing his bluffs based on factors like stack size and position more so than his hand, as he's up against the only player at the table he can put under pressure of elimination with a threatening raise here. One thing that's interesting to note is how much equities in this spot change compared to no-limit hold'em. Despite having no immediate outs, Lamb actually has nine percent equity. Contrast that with just under five percent in hold'em, and Lamb's equity with backdoors nearly doubles. Lamb's bluff, while seemingly pretty reckless, actually isn't as crazy as it seems. In any case, Yu opts to call, which seems best if Lamb is bluffing this wide. Doing so keeps all of Lamb's airballs in and also keeps the pot a little smaller in case Yu is coolered. Lamb turns a pair and decides to check back. The only reason to keep bluffing would be if he thinks he can get a king to fold. Given that he might still be able to do that on the river, checking seems sensible. On the river, the situation turns upside down when Lamb finds himself having backdoored his way into a full house. Yu once again checks, and Lamb has to decide what to do with queens full. Only a few hands beat him — K-K, K-Q, and 9-9 — and all seem unlikely aside from maybe quad nines based on the action and blockers. He opts to shove for value with a pot-sized bet and Yu has a tough decision. What bluffs does Lamb have here? The likely bluffs discussed above have all become straights or contain a queen in them. Yu can beat the straights, but would Lamb really turn a straight into a bluff? The most conceivable bluff would seem to be a pair of kings that Lamb has opted to turn into a bluff to try to get Yu to fold trips. But would he raise flop with such a hand? Well, he raised flop with a total airball, so maybe he would have some odd bluffs that Yu can't foresee. Remember, however, that Lamb also checked the turn. Raise-check-shove is certainly an odd line to take as a total bluff. A final consideration — would Lamb ever shove a nine to try to get Yu off a chop? That may be the most interesting possibility of all, and it's something to think about when you get to the level that these players are thinking on. I have no idea if that would be something Lamb tries here, but it's something to consider for sure. Yu is able to find the big fold, and although it didn't help him in the end — he would ultimately bust in fifth — he did save his tournament equity in this spot where Lamb got there in one of the strangest ways possible.